Intro to decimals. In this video we will talk about decimals. Place value and arithmetic with decimals. So let me say at the outset, if this is something relatively easy for you, if you're very comfortable already with adding, subtracting and multiplying, dividing decimals. Then you probably don't need to watch this video. You might just want to skip though briefly to make sure that everything is review. But don't spend time watching this whole video, if you already know this inside out. This video is designed for people that are a little shaky with decimals, and want a thorough review of the topic. So let's begin. First think about positive integers. Just ordinary positive integers. If we have the number 256, what that means is that we have 2 hundreds, 5 tens, and 6 ones. Those are the place values. So we could write this number in the form 256 equals 2 times 100 plus 5 times 10 plus 6 times 1. That's expanding it in terms of its place values. Notice that, as we move a digit to the left, the place value is multiplied by 10, and as we move a digit to the right, the place value is divided by 10. So for example, look at that 8 in the middle. So this is the expanded form in terms of place value. 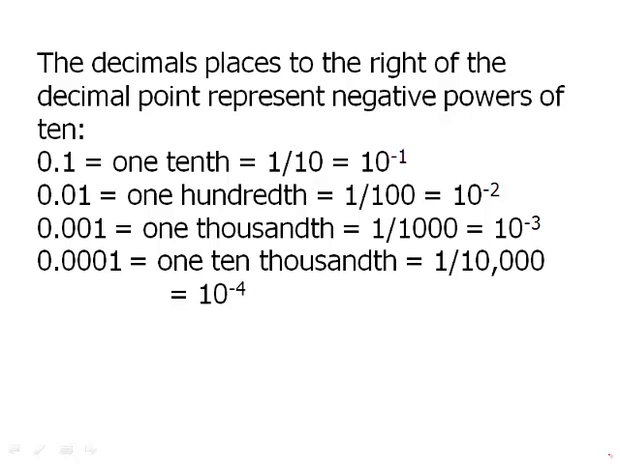 The decimal place to the right of the decimal point represent negative powers of 10. So .1 is 1/10th, that's 10 to the negative 1. .01 is 1/100th, 10 to the negative 2. .001 is 10 to the negative 3, .0001 is 10 to the negative 4, and so forth, you could extend this pattern. What can be a little confusing about this. There are a few things that are a little confusing. First of all, notice the zero to the let of the decimal point. That's purely decorative. I put that in for clarity, that has no mathematical meaning. All that matters here are the, the numbers to the right of the decimal point. Now some people get confused. Because how many zeros should these things have? Well if look at a 100 for example 100 to 10 to the positive 2, that's one followed by two 00s, that's very clear, people recognize a 100, so then when we go to 100th. Notice that that's something that only has one zero. It's 0.01. It only has one zero, and that really confuses people. But notice that 0.01, that's two decimal places. And this is very important. If we look a a positive power of 10 and count the number of 0s. That number zero would be the same as the number of decimal places in the corresponding negative power of 10. So for example I write 3.75 if I tack on extra zeros on right. Those are completely meaningless. They mean absolutely nothing. They may have this dim memory from science class that there was something called significant figures, and sometimes these zeros mattered and sometimes they didn't. We're not gonna worry about that. Significant figures are not on the test. The way that they use numbers in science is not the way that they're used on the test. So on the test, these zeros are completely meaningless. Now we can take a look at arithmetic with decimals, adding and subtracting decimals is quite straightforward. We simply line up the decimal points and add or subtract vertically. So suppose we have to add these two decimals. We're gonna line them up vertically so the decimal places are lined up. Once they're lined up then we just add. Similarly if we have to subtract these two numbers we're gonna line them up, the decimal places are lined up together. Now that they're lined up we're simply going to subtract. And that's all there is to adding and subtracting decimals. For multiplication, step one is to count the number of digits to the right of the decimal point. So suppose we're gonna multiply these two numbers. For each one, we're have to count the number of digits. Now, we're just gonna ignore the decimal points entirely, and find the product as if they were two positive integers. Integers. Suppose we just have the two positive integers, 625 times 48. What is this product? Well how do we find this without a calculator? Turns out there's an amazing trick that we'll talk about in a later video. This is called the doubling and halving trick. Turns out when you're multiplying two numbers, of course one thing that's always always allowed, you could multiply one of them by 2. And divide the other by 2. That's one thing that's always allowed. It turns out that is very advantageous to do this, if one of the numbers is even. And the other number is a multiple of 5. Turns out that is very advantageous to do this. This, so what I'm gonna do, I'm gonna divide 48 by 2, that's gonna become 24. I'm gonna multiply 625 by 2. 625 times 2 is 1250, so I change this to 1250 times 24. That has a 50 in it, so I'm gonna multiply that by 2 again, so divide 24 by 2, I get 12. Double 1250, I get 2500. Well, that also has a 500 in it so it makes sense to do this again. I'm gonna double 2500 and halve 12. Half of 12 is 6 and 2500 doubled is 5,000. Well, now I've got it into a form where it's very easy to multiple in my head. 5,000 times 6. That's 30,000. So this is a very handy trick to keep in mind. Now, we know we need give decimal places. We found that out from the original problem. Well of course, all the zeroes don't matter, we can just write this as 0.3, three-tenths. Notice that to find a power, that's a special case of multiplying. So for example, suppose we have to do 0.03, this is 3/100th, cubed. How do we do this? Well, of course this is 0.03 times 0.03 times 0.03. Notice what we have here that's 2 plus 2 plus 2 six decimal places the product will have six places to the right of the decimal point. So we know that even before we multiply now just consider the number itself 3 cubed is 27 so that last seven must lend six places to the right. Of the decimal point it must land in the one million. Place. When we move a decimal one place to the right, say 2.45 to 24.5, we are multiplying the number by 10. Since we multiply both the numerator and the denominator by 10, the value of the quotient remains unchanged. Essentially what we're doing is we're multiplying by 10 over 10 which is 1. So for example, suppose we start with this or we can start sliding that decimal point to the right. So I have to draw right one slot for the right again. At this point the numerator is now an integer, but it's really the denominator that matters. So we have to keep sliding to the right. What this does is adds zeroes at the end of the number in the numerator. And finally we get that number in the denominator down to an integer. Now we have 5,600 divided by 7. Well that's easy to do that's just 800. So now let's look at another example. Suppose we're dividing these two decimals. Again start sliding to the right slide to the right one point. We'll now notice we could keep on sliding to the right but notice 0.25 that's a quarter so notice that a very easy way to cancel that would just be to multiply the numerator and the denominator by 4.